GUESS WHO'S BACK! AND AT AN AWESOME NEW LOCATION!!!!! 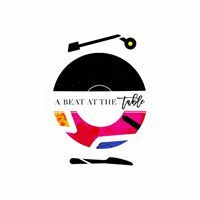 It is with great pleasure that we invite you out to a unique dining experience!5 courses paired with a soundtrack for the soul!Elevating the meal to new heights…and flavors! 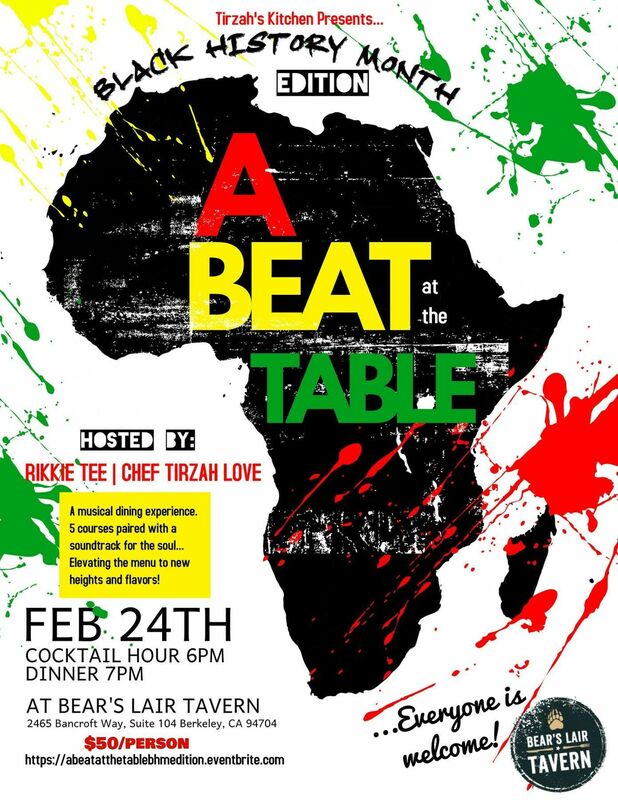 We will be celebrating Black History Month with a special 5-course menu curated by Chef Tirzah Love!!! Each menu item will be paired with a song/sound track that elevates your senses. Through smell, texture, taste, plating, and sound this meal is sure to be like nothing you've ever experienced. *Signature cocktails will be served at an additional cost. *Please dress to impress! 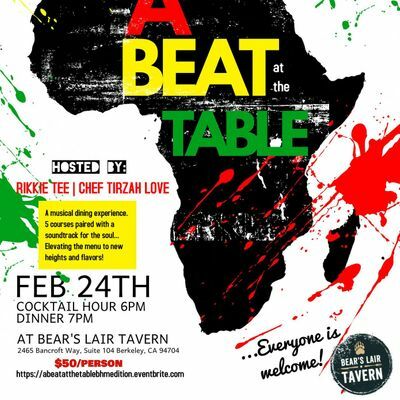 This is a 21 and over, upscale event.Hosted by: Chef Tirzah Love and Rikkie Tee(IG: @chef_tirzah_love @rikkietee)Chef Tirzah Love is a Private Chef and Caterer. Her love of cooking began at the age of nine, but her path to becoming a chef was far from straight forward. After working in private industry for over 6 years, Chef Tirzah realized that "If you do what you love, you will never work a day in your life"- Thus beginning her transition into becoming a chef and the birth of Tirzah Catering LLC. Chef Tirzah started her career by creating a simple blog which soon grew into catering requests for wedding receptions, baby showers, and upscale adult birthday celebrations. Through the powers of social media, Chef Tirzah was able to market her business effectively by expressing her passion for healthy, organic and GMO free cuisine. In 2013 Chef Tirzah’s culinary career reached new heights when she was asked to be a Private Chef for select players on the Sacramento Kings. She is currently working with the players on the Golden State Warriors and enjoys educating them on“conscious eating.”Rikkie TeeBay Area bred, but adulting in Phoenix, music has been a staple in Rikkie Tee’s life with her earliest memories being with her dad in his Z-28 Camaro and fingerless leather gloves, cruising to the sounds of Whodini, Prince, Sheila E, WAR, and so many others. 8-tracks, cassette tapes, floor stereo systems were a fixture in her upbringing, creating the unique soundtrack to her life, spending countless hours in her room browsing her dad’s music collection and creating her own. Being raised in Vallejo, with roots in Oakland and Richmond, Rikkie Tee’s exposure to the vast cultural diversities helped shape her love for music, pulling inspiration from her community. Professionally trained as a mental health therapist, Rikkie has found that music has been not only helpful in her own practice, but with her patients, creating connections in people who at first sight may not seem relatable. This passion for music inspired Rikkie to take a chance and acquire a new skill in life, using music to curate spaces, creating vibes to reach not only the ears, but the souls. There is no one genre or style of music that Rikkie Tee pins herself to, using her audience to influence her selection of sounds. Whether at the gym, in rush hour traffic, at home with your bae, or hitting the streets with your crew, Rikkie strives to find the perfect play list to pair with any activity, elevating it to new heights!